Any time is a great time to explore paper crafts, especially the holidays! Origami is the Japanese art of paper folding and kirigami is cut paper crafts that create 3D stand up or popup cards and art. Here are free printable origami and kirigami patterns and template for you to cut, fold and create. Pinterest has links for loads of free printable kirigami cut paper crafts and origami with patterns and folding lines printed on the paper. There are is a free printable origami frog, fish, turtle, pond scene and origami boat. Oh My! Handmade has free printable kirigami snowflakes. Crafts Crazy has morefree printable kirigami patterns. This link takes you to more free printable kirigami patterns. ScissorCraft is a great place to begin your children or students on folded or cut paper crafts, origami, kirigami and popup cards. Scissor Craft has free printable cut and fold animals printed in bright cheerful colors. Here free printable origami patterns and paper. Here are more downloadable free printable origami paper. Check here for origami patterns of cranes, koi fish, flowers and animals. Easy Cut Pop Up is primarily a pay site, but they do offer a few free printable kirigami patterns to create cute scissor crafts and pop up greeting cards. Scroll down the page past the 'buy now' patterns to find your free printable popup cards and patterns. And I'll give Easy Cut Pop Up this high five: their crafts are really nice and attractive. If you were going to purchase kirigami patterns, $3.95 each, this website's pricing, isn't a bad deal. Kirigami for Kids has wonderful free printable origami patterns and stencils perfect for young children to help them get the hang of cutting and folding paper. Check out their huge assortment of free printable popup cards and paper crafts. 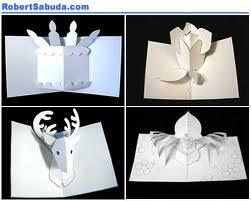 From this link, click around the site for lots more kirigami, origami and paper crafts. Origami and kirigami makes lovely paper crafts, gifts, popup cards and homeschool and classroom art projects.